A line of thunderstorms will slow down over Central Alabama and not clear the area until late tonight. This could result in some flash flooding. Poor drainage and low lying areas will be the most prone to this flooding. Additionally, rises on rivers and creeks are anticipated. 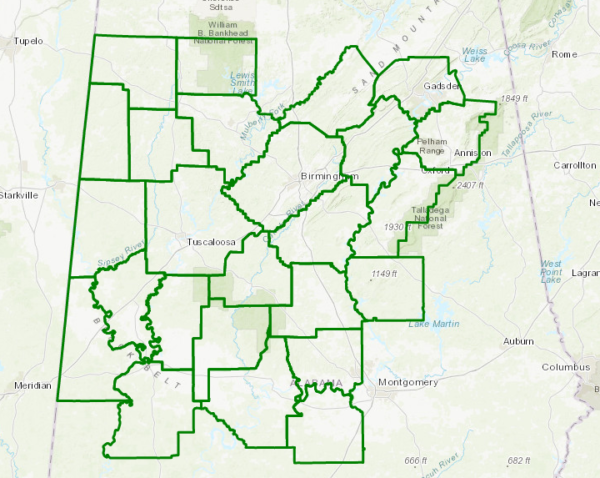 A Flash Flood Watch continues in effect until 1:00 AM Sunday for the following counties: Autauga, Bibb, Blount, Chilton, Dallas, Fayette, Greene, Hale, Jefferson, Lamar, Lowndes, Marengo, Marion, Perry, Pickens, Shelby, Sumter, Tuscaloosa, Walker, and Winston. Calhoun, Coosa, Etowah, St. Clair, and Talladega counties were added to the watch as of 4:25 PM. Rainfall totals of three to four inches could result in flooding of poor drainage and low lying areas, as well as rises along rivers and creeks. Remember, a Flash Flood Watch means that conditions may develop that lead to flash flooding. Flash flooding is a very dangerous situation. You should monitor later forecasts and be prepared to take action should Flash Flood Warnings be issued.